Today, we’re announcing a new integration between Azure Boards and GitHub. Development teams using GitHub can now take advantage of the rich project management capabilities offered by Azure Boards, including Kanban boards, backlogs, sprint planning tools, queries, and multiple work item types. By linking GitHub commits and pull requests to your work items in Azure Boards, your code changes become just a click away from your planning artifacts. The development section of each work item (bug, story, task, etc.) shows the latest status of changes, and when more information is needed you can easily drill through to see more detail on GitHub. Keeping code and work items connected should be easy, which is why Azure Boards uses workflows known and loved by GitHub users. 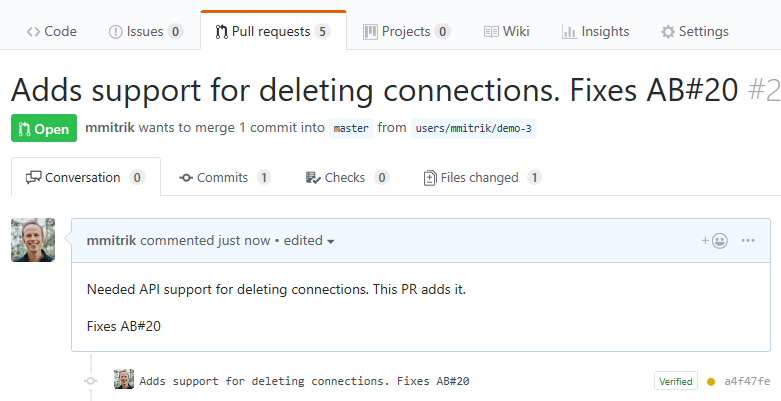 When you’re working on a code change and you want to relate it to the task you’re working on, simply mention the ID of the Azure Boards work item in the commit message, PR title, or PR description. The syntax used is “AB#[Work Item ID]” as shown below. When the commit is pushed to GitHub or the PR is created, Azure Boards will automatically create a link to the work item. If the PR or commit fix the bug, or complete the task you’re working on, simply just include the word “Fixes” before mentioning the work item, and Azure Boards will update the work item state automatically when the changes reach the master branch. Teams using Azure Pipelines to continuously build and deploy their code already have a deep integration between their code and their CI/CD pipelines. Adding Azure Boards to the mix deepens the integration, providing links from the build summary to the related code and work items for end-to-end traceability. If you’re new to Azure Boards, hop over to our homepage and click start free with Boards to create your first project. 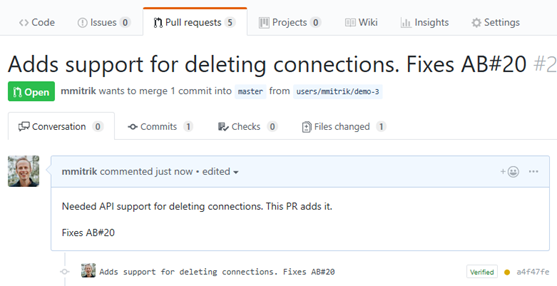 After creating your project (or if you already have a project), follow our simple guide to connect to your GitHub repos. If you have any feedback to share, or questions that need answering, please reach out on Twitter at @AzureDevOps.